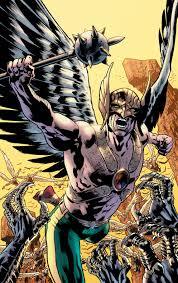 I've been a fan of Hawkman for a long, long time. I'm not old enough to have read the Golden Age adventures of the hero, but I was just the right age to enjoy the Silver Age version of Katar Hol, the policeman from the planet Thanagar who came to Earth with his wife and partner Shayera to learn from Earth police methods, all while fighting menaces in their Hawk-gear. After that the story gets a bit muddled by the various Crisis and reboots, but eventually Hawkman became Carter Hall, a hero from Earth who has been reincarnated along with his lover Shayera through many incarnations. We'll skip over the "New 52's" Savage Hawkman, who was "killed" by Despero in a recent mini-series (which was something of a mercy), and now Carter (the archeologist and superhero) is back for new adventures in a new series. Happily, writer Robert Venditti has taken the character back to his Golden Age roots, has incorporated the best aspects of his modern incarnation, and thrown in some really interesting hints around his ties to other worlds. The art is by Bryan Hitch and Andrew Currie, with color art by Alex Sinclair, and it's terrific. Hitch has given the hero's wings a new, natural look, making them behave more like actual wings, instead of the traditional, stiff look that's been the norm. Hitch, of course, is the master of Cinemascope splash pages, and you get those here in spades. But we also get a very human Carter, who has friends (gasp!) and acts like a good person (although he's a bit cavalier about the destruction of ancient objects). There are still lots of questions to be answered (like where is Hawkwoman? ), but this is a very promising start to the series. The comic has made this long-time fan happy about a Hawkman comic for the first time in a long time.